"Resilience is that human quality that allows one to be buffeted by life, disappointed, knocked down and defeated again and again, yet pick themselves up to take on new challenges, try new approaches or refuse to accept failure as a final outcome." -- Battling job stress: How cops can strengthen their resilience. 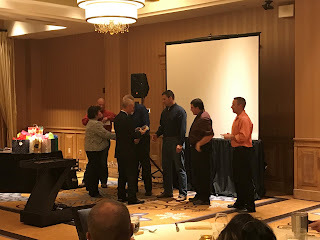 Fairly new to CDPS and law enforcement, I had the opportunity in September to attend the Colorado State Patrol Vehicular Crimes Unit (VCU) Resiliency Conference. The people and information I found there have profoundly affected me. The Colorado State Patrol originally launched the event 11 years ago as the "ART Retreat," with the vision of providing training and resources for the members of the Vehicular Crimes Unit -- a set of CSP employees who witness extremely traumatic car crashes. After a few years, the event expanded to include the CSP Victims Assistance Unit and members of CBI. which is more than 10 times the rate in the general population. This striking trend underscores the importance of addressing and mitigating the unique stresses that face first responders. Conversation and presentations at the conference provided me with insight into the experiences of CSP and CBI first responders and the fallout they endure due to repeated exposure to traumatic crime scenes. The goal of the conference is to help them build resilience in the face of such stress. The conference agenda is a combination of intense practical application skills and discussions, along with a few shared meals as a group, and time for relaxation, reflection, and fun. The presenters get down to the nitty gritty on the dangers of stress to the individual, as well as the secondary stress impact on family, friends, and colleagues. The conference explores healthy response and prevention options to counter and prevent PTSD symptoms. The conference provides an opportunity for attendees to take pause in their uncertain and demanding schedules, which pivot on any given day based on crimes that can occur anywhere, anytime, day or night. CSP Victim Advocates, of which there are only seven in the entire state, maintain a schedule that allows them just two weekends off per month -- and like all responders, this is dependent on what is going on any given day. Dolores Poeppel, director and founder of the Victims Assistance Unit, is quick to praise her dedicated staff, and they return respect and admiration for her as well as each other. “I love my job,” is the theme I unanimously heard throughout the conference as I spoke with them individually. Spouses and children are encouraged to attend the conference. One of the important symptoms of burn-out or PTSD is withdrawing from those who know you best. Understanding this from the perspective of both the first responder and their family members can open up communication and options to deal with the trauma together. I filled a notebook with the practical ways to recognize and combat repeated exposure to trauma symptoms. The tips, tools, resources and recommendations are valuable for any human being, even if you're not among the esteemed heroes who are the primary target audience for this event. Develop your other identities: sister/brother, cousin, father/mother, wife/husband, son/daughter, etc. We are continually scanning for what might hurt us; train yourself to also scan for good.